See? fairly simple to understand. I’m not going to buy name-brand hardware. Even if I do I will most likely file the logos off of it. If it’s one thing I learned about life and general commerce is a lot of things in this world is pure hype. Also, as a skateboard is a reflection of who you are it shouldn’t be filled with company logos all over the damn place unless of course your are being sponsored by those people. Like my website I like to keep things ad-free! For the deck itself I purchased this blank deck almost 10 years ago and it has since sat in a closet during the summers and winters in an uncontrolled apartment complex. Years of such temperature shifts have taken its toll on the board with micro-fractures all over the place. 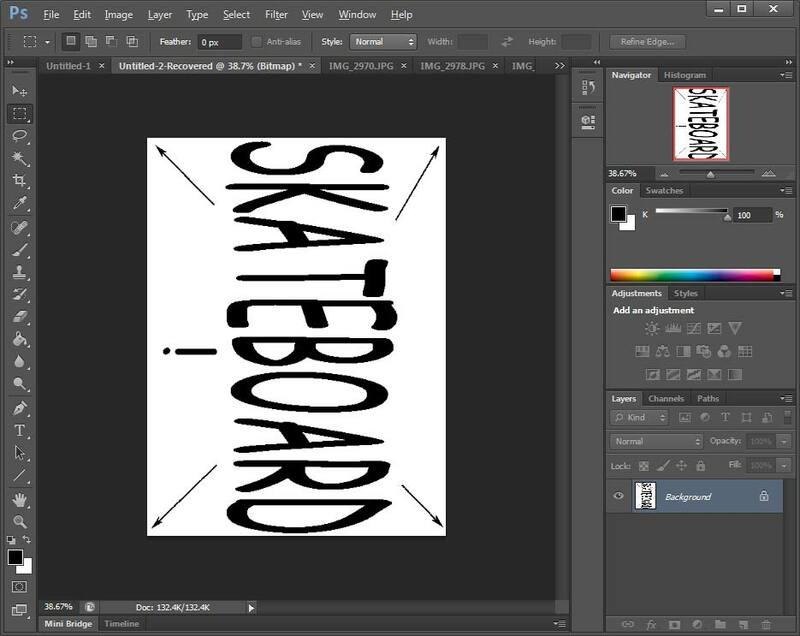 We originally got this board because we wanted to learn how to do skateboard art (and I still do) but after seeing what happens to a board that just sits it brings up the interesting question of how long a skateboard can really sit in storage? I’m sure in a controlled environment it would be perfectly fine. But life isn’t going to always be 70 degrees 24/7. There’s literally nothing that can be done to fix the stress fractures so minus well ride it until it breaks! Why not! Lets put a “Captain Obvious: This is a skateboard!” sticker on the back of this board! I can put something else on it later! This will be the first skateboard build that has been done for 20 years of us being out of it. When you’re new to skateboarding you don’t want to go all out and buy the most expensive deck in existence just to fall, break your arm/leg/neck and suddenly be done with it. Ideally you would want to go to your local skate shop to which they will setup a board for you anywhere from $60-$150 US and it will be a very capable board! Since I had a screwed up blank deck I decided to go with the Owlsome complete setup because it practically gives me everything I need to complete this deck. Also went with Owlsome because: Animal names + skateboard = furry trash. I’ll admit it! What’s in the Owlsome skateboard complete set! set of spacers to prevent loose trucks from wheel-biting into the board. set of bearing spacers 1/5ths of an inch or 10.16mm to stabilize your board as you ride upon it. 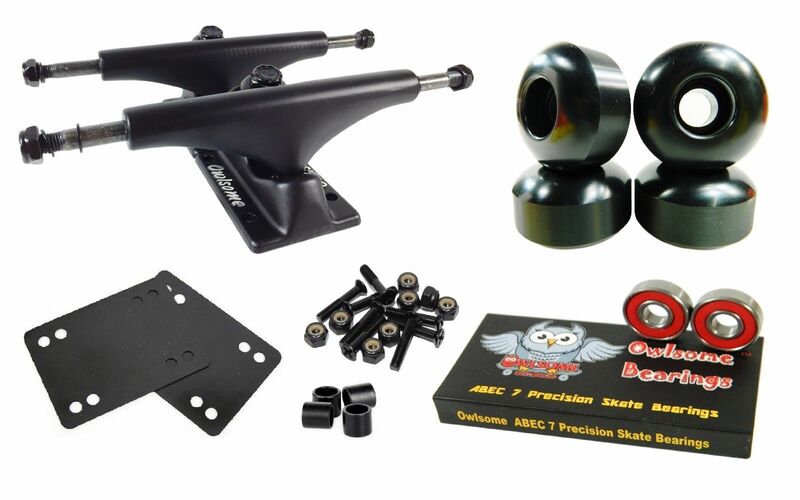 set of ABEC 7 skate bearings which the ABEC standard is pointless to a skateboarder. None of us are pushing 100mph (160kph) down the road! 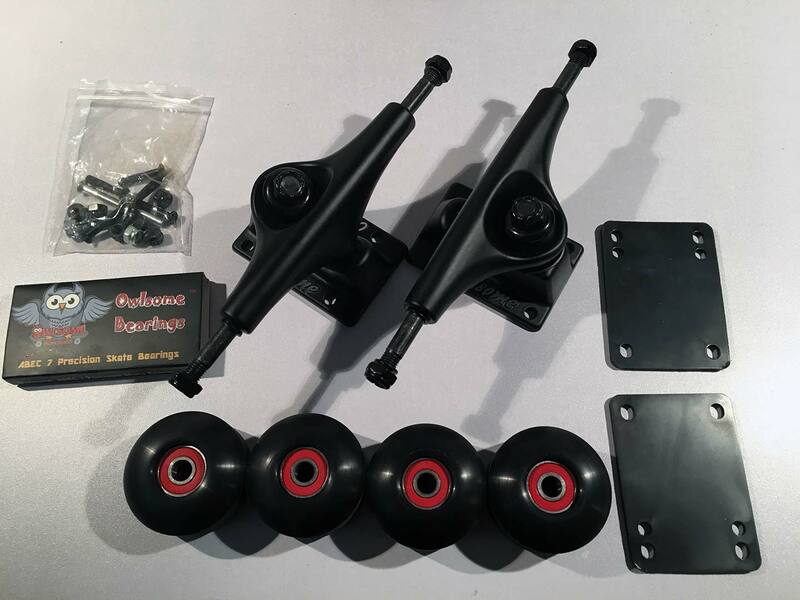 four 52mm black skateboard wheels of unknown durometer rating (buyer says they are 95a. I have a difficult time believing that!). Fasteners and screws required to complete the deck. I decided to do some looking around online for the Owlsome brand. No one was saying anything above them and the reviews on Amazon were rather neutral with people stating that it’s a good starter pack for a skateboarder. The first warning sign it should have given me is that hardly any legitimate skateboard shops on the net carried these things. In this picture we’ve taken the liberty of mounting the bearings into the 52mm wheels. I received this kit within 4 days from an E-Bay vendor in California for the grand total of $25.99 USD shipping included. Although the visual inspection for truck alignment passed. 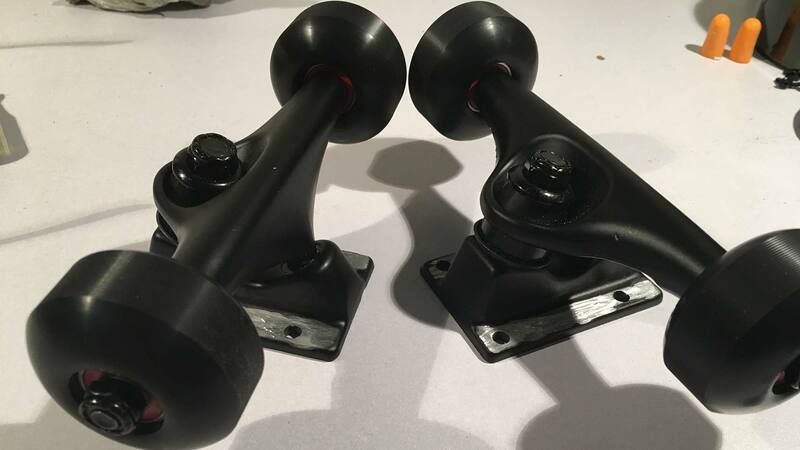 The ends of these trucks are pathetic in the fact that there’s some metal burring going on and even some powder coat issues. This will cause the bearing washer to not sit properly. If the bearing washer cannot sit evenly on the truck then the washer will dig into the bearings causing damage. This is just simply poor quality control on Owlsome’s behalf but it’s not a deal breaker. With just a little bit of rotary tool work using a standing disc we were able to very lightly scrape off the excess material without damaging the frame of the trucks themselves. As you can see the bearing washer now lays flat against the truck hanger of the skateboard as it should. Everything is aluminum so loosing its powder coat finish will at the very worst oxidize the metal from general use. Not the end of the world. 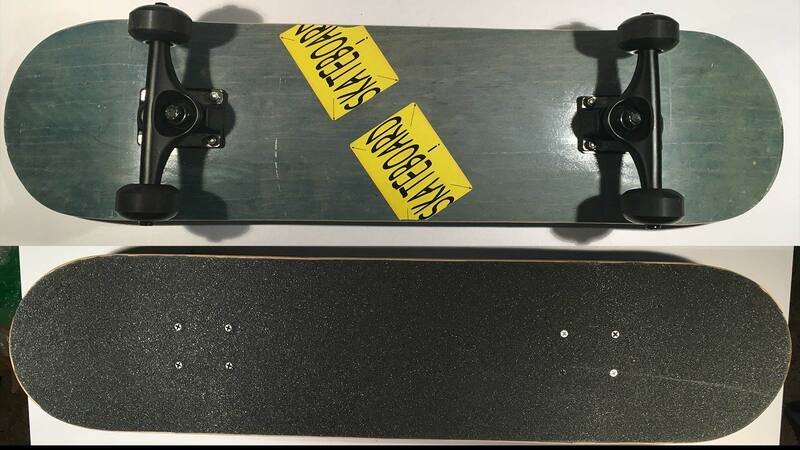 I should note that this type of defect can happen on even the big brands and often times the retailer which is stocking the trucks will catch this before it even hits the sales floor of their skate shop. 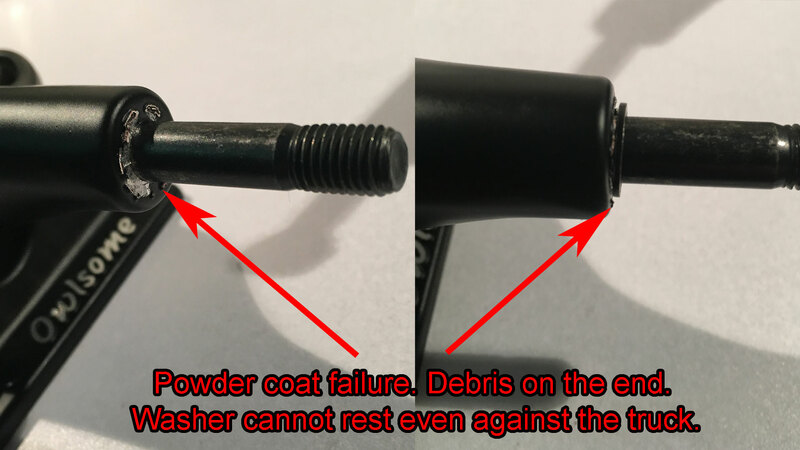 This is the perils of buying your skateboard equipment online. Since we got the rotary tool out minus well remove the logos at the base of these trucks. No need to advertise the brand of skate trucks I have. As long as it goes down the street we’re good to go. 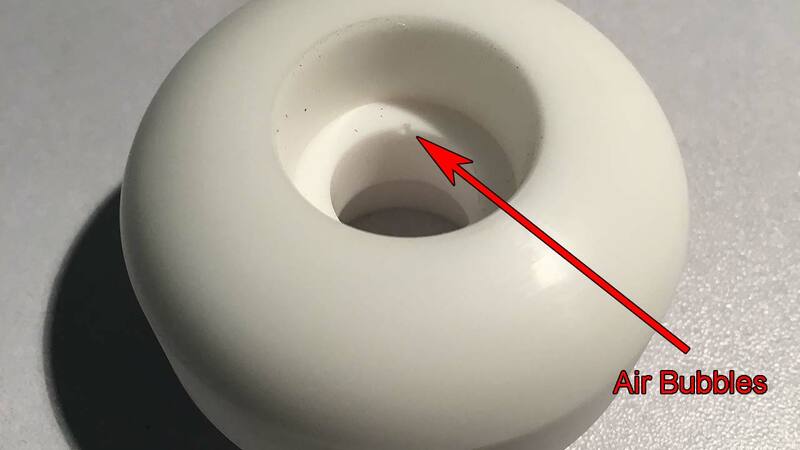 The picture above is a white 54mm wheel from the blank skateboard company because taking a picture of a black wheel to show the defect was incredibly difficult! I am going to say that the wheels are just “Okay” there is still bubbles from the Polyurethane setting in the mold so these wheels are far from perfection. However, for the price and for what they’re being used for which is to simply get back into skating. They’re acceptable. Differences between generics to brand wheels. When you go for name-brand wheels. You are purchasing perfection. A company like Bones or Force has taken the necessary quality control steps to eliminate this problem by discarding the flaws while raising the price on you the consumer. 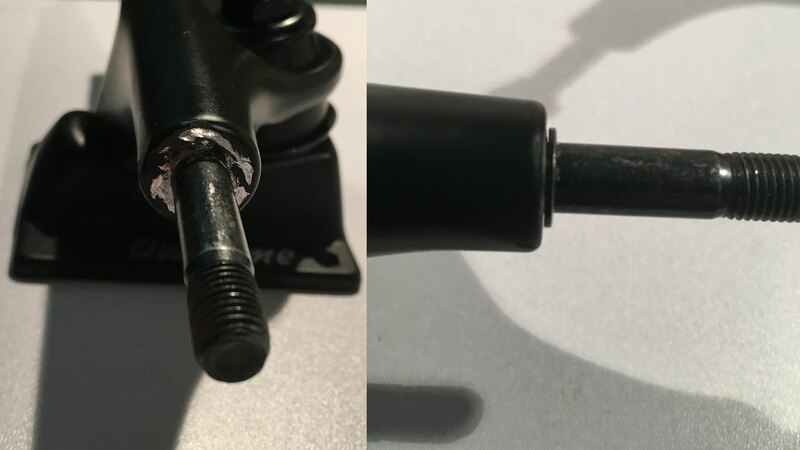 But when you purchase cheap wheels you are not going to get that level of quality control that you would come to expect from a name brand company. These air-bubbles could eventually make the wheels crack and break apart. 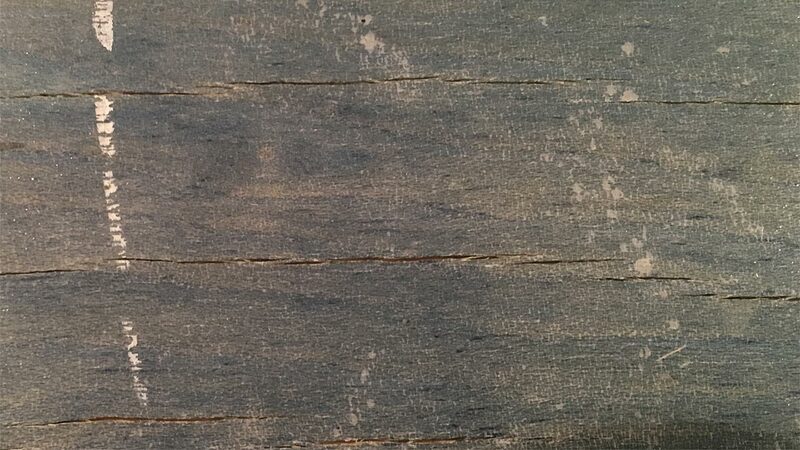 It’s debatable that the polyurethane mixture may not be as strong as a name brand either and as a result flat-spots could occur when doing a lot of grind tricks. It’s really up to the skater if they want to pay for the best at $25-30USD for a set of name-brand. Or simply go for a generic at $6USD. As we’re a starting skater which has no intention of jumping up and doing 50-50 grinds during the first few weeks of skating. Generics are just fine! Despite the fact that on the box they scream ABEC-7 rating that I’ve come across another bearing company by the name of “Amphetamine” which their ABEC-5 bearing perform so much better! I have not removed the seals or changed out the greasing compounds in these bearings so the base feeling about these Owlsome bearings is that they feel like they’re just a few steps above a Kryptonics skateboard. And that’s not saying a whole hell of a lot! Although not the greatest purchasing choices that I’ve made to jump back in. It’s at least a start. And over time I shall commit towards making my purchasing choices more local country/state oriented in an attempt not just to support the skateboard shop. But to support industry within my country that chooses to support the sport that we’re pursuing. Of course this means I can’t buy Redz Bearings like every skateboarder loves. But oh well! It should also be noted that when you’re older. You’re usually heavier then you were when you were in your early teens. Bones will break and you may not get up as fast. Personally we’ve taken a few slams just for doing some manuals because you have to start somewhere! If there is one thing I have to say to any other person age 30 and up who wants to get in touch with their inner childhood is get pads and helmet! If anyone gives you crap about it. Calling you a poser or too old. Well. Outside of the infamous middle finger which we personally prefer to give to such individuals. Maybe people are like that in my state because Wisconsin tends to be a little less forgiving then the coastal states. Or just the simple fact that people can be assholes. Being able to walk and go to work is more important then “Looking cool”. So wear the safety gear! Very interesting website i have bookmarked s-config.com for future reference.